The 1940's were dominated primarily with World War II efforts. Women made an exodus from the home to the workplace, in an effort to replace men who had gone off to war. While wartime production pulled the U.S. out of the Great Depression, rationing still affected the food we ate, the clothes we wore, the toys with which children played and the lifestyle we kept. Radio became a lifeline for most Americans, providing news, music and entertainment. It was not uncommon for life to come to a screeching halt as literally hours were spent huddling in front of this "humming box" in the corner of the living room. 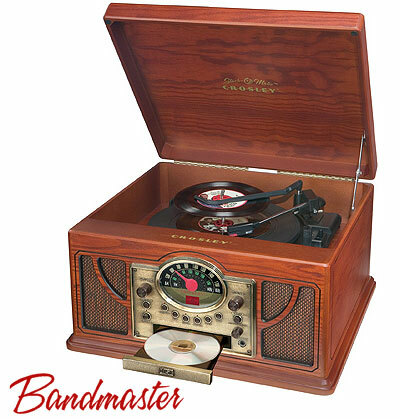 Leave it to Crosley Radio to bring back a little nostalgia with The BandMaster. Enjoy music on what will easily become the center of every family gathering. The BandMaster features Crosley's very own Stack-O-Matic™ Technology allowing you to stack up to 6 records and drop them automatically for continuous play. The analog AM/FM radio is handsomely showcased with an illuminated center dial while a dose of modern-day-technology includes a programmable CD Player with 20-track memory.